Sorry for ANY confusion – I bought a 900 Mhz GSM phone, which will NOT work in the USA. My post below had the wrong number in it (now corrected). Sorry! The Motofone F3—a beautifully designed phone. Sadly, the only version of the Motofone available on eBay is a 900/1800 dual band phone, which does not work with carriers in the US. The GSM version that will work in the US—850/1900—is only available in Mexico and Chilie. However, through the wonders of eBay, I was able to get a hold of the European version (the 850 900 variant). I was originally going to send it back to the seller, as the auction claimed it was a tri-band phone. Instead, I could not wait and decided to open the guy up. What follows is a disturbing set of pictures—be forewarned that these images may be disturbing to those of you who shed a tear at the destruction of a gadget. I will be updating this post with commentary along with each picture. This is the front of the Motofone. A bit dusty, but you get the picture. I feel this part is the least exciting, as we’ve all seen this same picture over and over. Again, not quite that interesting. Just the back, but with four oh-so-tempting torx screws (T-5 to be exact). Can you feel the tension building? Here we have removed just the back cover. An interesting array of copper contacts can be seen below the battery, to the right. Possibly for communication with the phone (no USB port), it’s purposes are unclear. The battery removed, standard serial #, IMEI #, etc… plus some barcodes. SIM card removed. 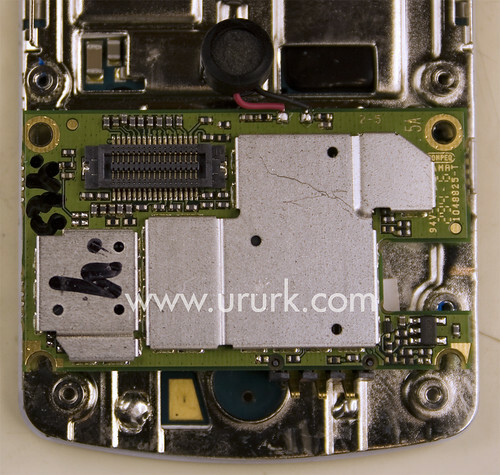 The battery must be removed to remove the SIM card. Silver Torx screws removed. To remove the casing from the keypad/display, run your fingernail along the front of the phone between the keypad edge and the casing. Doing this a few times separates the two halves. You also will have to pry up on the casing at the top and bottom, and *slide* the casing upwards. This is the inside of the back phone casing. The Motofone is essentially 3 pieces. The display/keypad (next picture), “Motherboard” rev MA, and the back casing. You can see the speaker at the top with two spring contacts and the antennas are top and bottom. This is a closeup of board MA, side 5B. 4 black phillips head screws (PH000?) have been removed. The microphone is attached with two wires, and fits into a hole in the keypad/display assembly. This is the back side of the keypad. An amazingly thin assembly. It is soldered to the keypad, no screws visible to disassemble it. I did not take a picture of the front—it is exactly like the front, minus the barely-visible bezel. This is a horrible picture, but hopefully it gives you a sense of just how thin this phone could be, if there were no battery. If I were to be reimbursed for the cost of this phone, I’d tear it apart, unsolder the casings above board MA, and unsolder the keypad assembly to reveal all the E-Ink(y) goodness. Was the 850 variant carrier locked, or were you able to use it with t-mobile? I’d kill to replace my current phone with one of these. Hello, first of all, sorry for my bad english; this is not precisely a question about dissasembly, but I hope you can help me: I have a F3, and I like the “inverted” mode of the display in stand-by (white characters, black background), I want to know if there are any way or trick to set the phone to show always the display in that way, instead of invert it to white background in operative mode. Thanks. I don’t know, sorry! I don’t think this is possible… however… *IF* it was possible to reverse the polarity of the device that drives the display, then you would get the effect you want. Basically, it is a segmented display, and is very simple (as compared to an LCD). The way e-ink writes about their product, then i would imagine it is this simple. Getting to the power supply, however, seems a daunting task. I’ve got one of these (I’ve had it for 6 months), and it is FANTASTIC! Even though it’s not a popular phone model in Thailand (it was made primarily for India), I’d love to have about 3 of them (the price is so low). Are these phones available in thailand? If so where? Could you further dissassembly the metal tops of the ‘Faraday-cages’. In other words: what chip(sets?) are used. I heard about a one-chip TI solution, but it could well be Infinions solution.. Thanks in advance. Great work! I took the final panel apart. Its scary. Its all stuck down and you have to pry it apart with a flat screwdriver. The PCB bends substantialy! I got like a 20 degree bend without breaking it. That goes for the e-ink screen too. There is however not much point in doing this. All I suceeded in doing was making sure I couldnt re-assemble the phone. There are only 2 ICs under the metal, and they are the driver ICs for the e-ink screen. 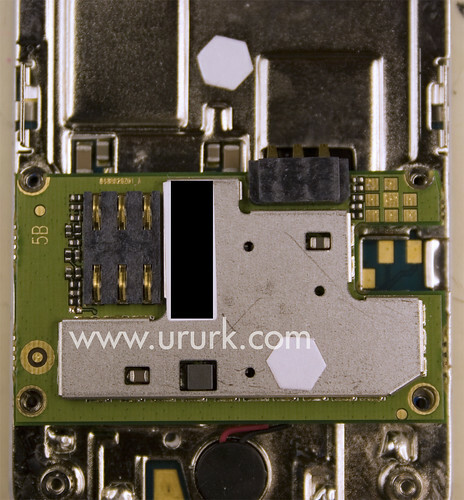 The plug in module at the bottom appears to be the whole phone, with connections for keypad, screen, leds mic and speaker on that little connector. To use the e-ink screen just remove the phone and find the pinout for that connector! but I cant get a datasheet yet. I have a f3 moto but sometimes when i press first icon message it sends a vacuum message. So it is a wasted call.Any comment good guys! Is there a way to clear the incoming/outgoing calls log? I got one in Guatemala. It was already assembled when I got it. My problem is that I can’t get the battery door off. How does one accomplish this? I’ve tried pressing on the chrome latch and it doesn’t move. I’ve tried screwdrivers and other assorted tools and no luck. Which direction do you move the chrome latch? What is the process of removing the door? You need to press in slightly at the chrome button, then pry upwards – the metal latch isn’t so much of a latch, as a way to get your fingernail under the back cover. This cell represents what cells should be. Calls, SMSs, Alarm, excellent battery life & network coverage, vibration (silent mode). i bought one of these in the states. online deal of the day. but, having no sim card, i didn’t use it until now, when i’m in thailand. the inital prompts are in spanish, which i don’t understand. i put in my sim card from DTAC. it asks for time and date, then it appears to be asking for some kind of code number… key presses are masked with an *. you have to type 8 or 10 characters before the underline check mark appears, pressing up arrow key then gives “codo incorecto” or something like that. what number is it asking for? i can’t find any documentation about this. and at some points it says something about “no sim”… but there IS a sim card inside. any ideas? Sounds odd – if you bought it in the states, it should have been the US version, probably defaulting to english. It also sounds like it is locked. Who did you buy it from? What type of cable/adaptor is required to use a vintage handset with the MotoFone? I don’t know – but I think it uses a (standard?) 1/8″ mini stereo jack. I would like to buy a brand new F3 motofone 900/1800. I know that this phone is very cheap. Do you know where i can buy it? It’d be super if they released F4 – essentially an F3, but with bluetooth and gprs functionality + water/dust resistance at IP66. Hi there, I’m looking for help ! I accidentally removed my F3 battery while it was switched on, and it has totally frozen. Whether the battery is in or out, the display is now stuck at 12:15, the signal and battery indicators are stuck at halfway. Do you know any way of doing a system reset ? Many thanks for any help you can give !